Argentina is the third largest power market in Latin America in terms of total generation (136.5 TWh) and consumption per capita (2,931 kWh) as of 2017. During the 2010-2017 period, the electric power sector’s GVA in Argentina grew at a CAGR of 2.7%, compared to a 1.1% CAGR of GDP in the same period, hence increasing its share to 1.56% in H1 2018 from 1.35% in 2013. In December 2015, the current ruling coalition declared a state of emergency in the whole energy sector, claiming that years of underinvestment, tariff freezes and growing demand had put the system at risk of collapse. One of the most important measures taken in this context was the implementation of Law 27,191, which aimed to increase the share of renewable sources in total power generation to 20% by 2025. As a result, three auctions for this kind of power were held between 2016 and 2017. 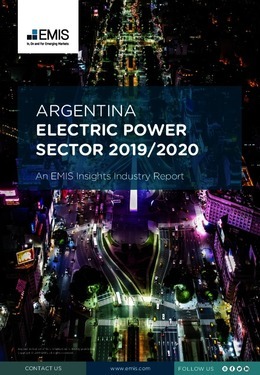 This report provides a complete and detailed analysis of the electric power sector for Argentina. EMIS Insights presents in-depth business intelligence in a standard format across countries and regions, providing a balanced mix between analysis and data. Build a clear picture of trends and issues for specific sub-sectors (e.g. power generation, transmission and distribution, and consumption).